The story of Harold Charles Howlett is a poignant one since it ends in a drama involving another Swavesey man who spent a great deal of time after the war reproaching himself for not doing more to prevent Harry's death on or shortly after 9-Apr-1918. The survivor in question was Robinson (Bob) Mitham and to this day Bob's nephew recalls his Uncle's anguish regarding the fact that he had been forced to abandon his friend in "no mans land" during the final year of the war. 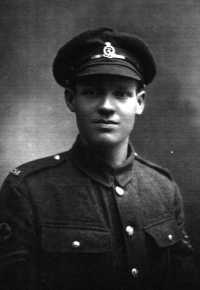 Harry Howlett signed up on 29-Mar-1916 almost a year after his brother Thomas had enlisted with the Cheshire Regiment. William and Elizabeth Howlett would have been proud albeit extremely apprehensive parents. 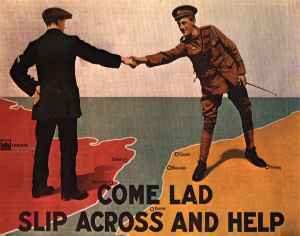 Harry enlisted with the 5th Suffolk Regiment and left for France on 7-Sep-1917 switching to the 9th Suffolks. By then Tom had already been wounded in the knee at Gommecourt. Bob Mitham joined the Suffolk Hussars on 14-Apr-1916 following in the steps of his brother Sam who had joined the Royal Engineers on 12-Nov-1915. By 8-Dec-1915 the Suffolk Hussars had completed their stint in the front line trenches at Suvla Bay fighting the Turks and had been evacuated along with the rest of the Allied Gallipoli force. Rather than join the Hussars in Italy Bob was drafted to the local Regiment - namely the 11th Suffolks following the decimation of that Battalion on 1-Jul-1916 (the day on which Jim Prior and Jonas Dodson from Swavesey lost their lives). Suffolk Yeomanry with fellow soldier. In February 1918 Harry joined Bob Mitham and other local lads in the 11th Suffolks. The Regiment had suffered grievously during 1917 - indeed on 28-Apr Alfred Linford and James Hepher (both Swavesey lads) had been killed during a fruitless assault on the chemical works at Roux. During the course of the war the 11th Suffolks lost 1053 men killed - the normal number of men serving in the battalion at any one time was approximately 1500! Meanwhile Sam Mitham had been attached to the famous Highland Division in early 1918. Sam always kept his mother informed and indeed had written home within a few days of arriving in France for the first time. "We went out to a small village some 20 miles behind the firing line on Saturday. We could hear the guns quite plainly.....We had a big day here this morning. General Joffre had been decorating six French and two English soldiers with, I think, the Legion of Honour." Later Sam told his mother about encounters he had with other Swavesey men serving on the Western Front. "......Henry Key, of the Sherwood Foresters. I was walking up the street of a little village and I saw someone looking in a small shop window at some picture postcard. I went up to him and patted him on the shoulder. He looked around and exclaimed "Good God - it's Sam Mitham! ".....I showed my copy of the weekly news.....I took him over to see George Dean (another Swavesey man in the RAMC). Dean is about 9 miles from here. I thought I would write and tell you that the boys have not forgotten the old village." Royal Army Medical Corps. Italy, Apr-1918. During a short couple of months in 1918 Harry Howlett was to lose his life, Bob Mitham was to get a Military Medal, Thomas Howlett was to be severely wounded and Sam Mitham was to end up in a German coalmine as a prisoner of war. The catalyst for all of these events was Ludendorff's last ditch offensive designed to win the war before the Americans could arrive in force following Russia's withdrawal from hostilities. "On the night of the 7-Apr the enemy fired an enormous number of gas shells into Armentieres and soaked it to such an extent that the town became uninhabitable. The main attack came against a Portuguese division to the south and the 40th. When as the day advanced everything on the right had given way the weakened 103rd Brigade threw back a long defensive line facing south in the direction of Fleurbaix. At the same time the reserve 101st Brigade was ordered up to cover Bae St Maur bridge. The 11th Suffolks got into Fleurbaix reinforcing comrades in the 12th Suffolks. These two sturdy East Anglian units held the village in a desperate fight for many hours." This rather stiff text belies the drama of this action which preceded a wholesale British retreat in this sector. 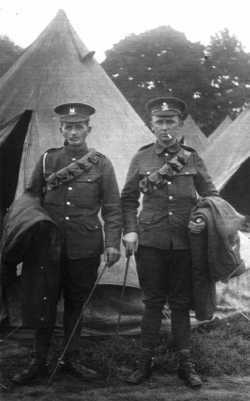 Harry Howlett & Bob Mitham were stretcher bearers and again & again they ventured into the maelstrom of the front line battle in order to extricate wounded men. Harry had been wounded by shrapnel but Bob Robinson had been unable to help him in the teeth of a ferocious German assault. Indeed Bob had assumed (erroneously) that his friend had subsequently been taken prisoner. In fact Harry Howlett aged 21 died of his wound and now lies in the Suffolk cemetery at La Rolanderie farm near Erquingham. Bob Mitham need not have reproached himself - indeed he had done all he could. His bravery was recognized by the award of a Military Medal. "He attended single handed to the very numerous casualties of his Company under heavy fire, when the other stretcher bearers had become casualties." 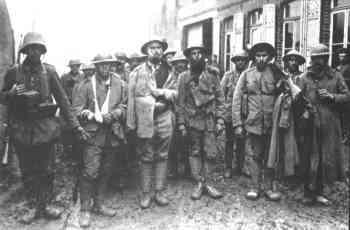 British and Portuguese prisoners taken 9-Apr at Lys. On 25-Mar Sam Mitham had been captured and Robinson senior, his father had received a postcard from Limberg camp where Sam had been interned with (amongst others) his cousin Arthur Beamont. "He was one of a crowd of about fifty men who had been collected by a Colonel of the Seaforths, all of whom except about half a dozen had been killed or wounded......at once employed in carrying wounded and his first night was spent in a captured British hospital.....drafted to a coal mine. His breakfast before going down the pit was a piece of black bread and a cup of coffee made from acorns.....the soldier sentries contented themselves with pushing and kicking at the least provocation. The 150 Russian prisoners received particularly cruel treatment." 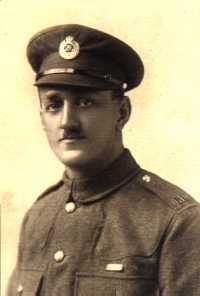 Thomas Howlett was injured by a shell in both arms on 20-May during the fighting around Arras and was discharged from the army shortly after the war had ended without returning to the front in the interim.